Ella Pauline Peterson was born near Cashton, WI, daughter of Anton and Maria (Dokken) Peterson (later changed to “Benrud”). She was baptized at the Melby Church and confirmed at the Immanuel Lutheran Church. She attended the Woodard school. 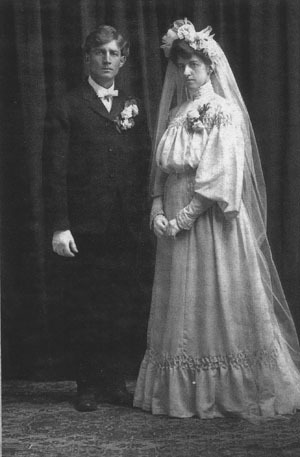 On March 5, 1904, she married Cyrus Bennett Johnson (1879-1939) and they farmed in the Cashton area until 1916, when they moved to Broderick, Sask., where they farmed until 1939. Ella’s death in 1956, followed a number of strokes. Ella and Cyrus Johnson had nine children: Mabel, Mrs. Ivan Wood (1905-1983); Alton (1908-1982); Chester (1910- ); Ethel, Mrs. William Dougan (1912-1974); Jeannette, Mrs. Roy Bahr (1914- 1979); Elvina, Mrs. Oscar Sjovold (1917- ); Norma, Mrs. Roy Lee (1919- ); Ruby, Mrs. Robert Grunerud (1921-1999); and Floyd. Ella and Cyrus Johnson are buried at Green Valley Cemetery, south of Broderick, Sask.